The Girnock Burn fish trap is one of three long-term fish monitoring facilities in Scotland established in the 1960’s and provides detailed information on adult and emigrant numbers of Atlantic salmon. Girnock Burn fish populations are dominated by spring-run multi-sea-winter adult Atlantic salmon which return annually to spawn and juvenile salmon heading seawards. The Girnock is therefore an immensely valuable and unique research and monitoring facility. Salmon populations of the Burn have been the subject of monitoring work for more than 50 years and this latest research could influence and guide the planting of trees where they would have the greatest benefits. Scotland’s rivers are most likely to feel the impact of climate change through an increase in water temperature, particularly during summer months. 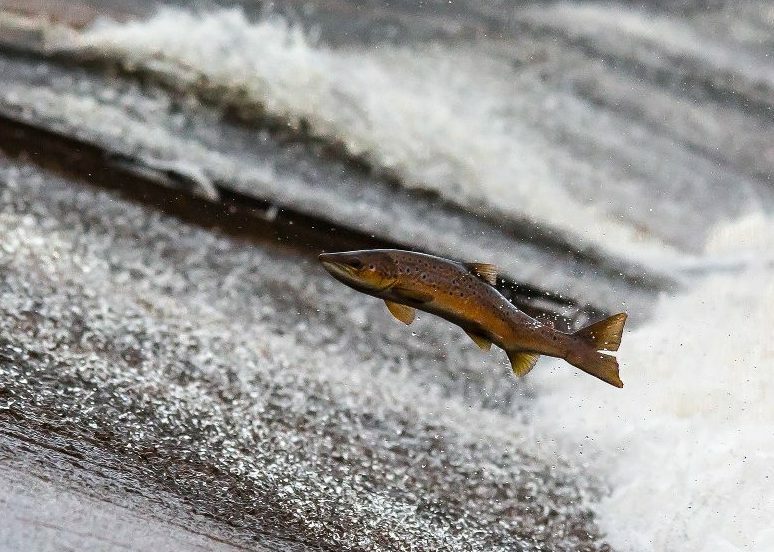 To many fish, in particular Atlantic salmon and Brown trout, stream temperature is of the utmost importance for the growth and survival of the species and both are relatively intolerant of high temperature. So there are genuine concerns that elevated stream temperature could alter the thermal suitability of Scotland’s rivers to a range of native freshwater species. This has resulted in a collaboration between MSS and UoB on a number of projects to better understand stream temperature patterns in Scotland’s rivers and identify strategies for reducing the impacts of climate change on stream temperature. The researchers suggest that a better understanding of the role of trees in reducing stream temperature might be best achieved with the ability to better characterise both tree cover and the effects of river bank-side shading; a difficult and costly exercise, especially in remote locations. The HoTRiverS project teams’ use of a drone (a small unmanned quadcopter equipped with a high-resolution camera) to obtain high resolution aerial photographs addressed this problem. This new low-cost, high-accuracy technique has the potential to improve our understanding about how and where tree shading produces optimal stream temperature reductions. Read the full article at Drone Below and find out more about the project here.